Southern Skies Coffee Roasters: 1052(LOVE)! I collect all kinds of coffee-related things. This, from Korea, is one of the stranger things that I’ve come across in my travels. Carbonated soda and coffee isn’t a flavor combination that I would’ve come up with on my own. I’d like to report to you that the combination works, in spite of it being quite unorthodox. I’d like to, but I can’t. It’s horrid. There’s nothing good about it, except for the wackiness of the packaging. Korea, like Japan, has an infatuation with the English language. And much like a pre-pubescent boy who is infatuated with an older woman, what seems right in theory, doesn’t apply itself very well in reality. 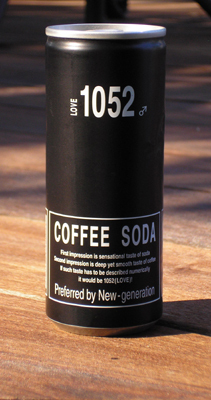 Math not being my strong suit, I’m not exactly sure of the correlation between the number 1052 and love, but according to the soda manufacturer, it’s preferred by the new generation. There are two different cans: the black one has the “male” symbol, and the silver can has the “female” symbol. I thought that maybe the two different types tasted different, but not a chance. Both are equally bad. Any of you math wizards out there want to clue me in on the 1052 code?